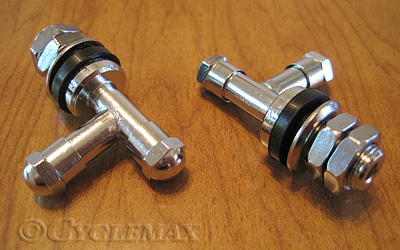 Note: For those of you trying to fit these on a bike other than the GL1800, here are some dimensions. The diameter of the threaded portion of the stem that would fit through the hole in the wheel is .400" or 10mm. So, the hole in your wheel will need to be slightly larger than that. The height of the stem from the rubber washer that would be against the wheel to the top of the chrome cap is 1.400". You will need to make sure you have enough clearance on your wheel for this plus any sensor that you may be installing on the top of it.